Have You Been Involved In a Recent Auto Accident? Greater Cincinnati Chiropractic Can Help! Call Us Today for Immediate Appointment! Auto accidents in Cincinnati Ohio occur in the hundreds daily. They can happen to anyone in just a blink of eye without any warning. Just because you are a great driver doesn’t mean it can’t happen to you! 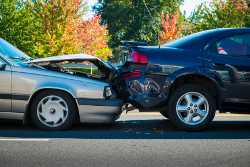 Most auto accidents in Cincinnati are minor and do more physical damage to the vehicle than the people inside. The truth is that back and neck injuries from auto accidents can show up months later, so it is best to get medical examined as soon as possible after the accident. Please consider the likelihood of a whiplash injury. Whiplash injuries need to be taken very seriously. The symptoms of a whiplash injury can sometimes be “silent” and can take several weeks or months to manifest. You can be easy to be fooled into thinking that you are not as injured as you really are. Too often people don’t seek treatment following a car accident because the severity of the car accident wasn’t that significant and they don’t feel hurt. It is always best to get evaluated by a chiropractor like Dr. Gallentine after a car accident even if the accident wasn’t that severe. Even the best personal injury lawyers will tell you that they always recommend after a car accident each victim seek an immediate medical evaluation. The most common injury to the neck in an auto accident is a whiplash injury. Whiplash is caused by a sudden movement of the head, either forward, or backwards, or even sideways movement, that results in the damage to ligaments and other connective tissues or even the supporting muscles the neck and upper back. Unfortunately the more time that goes by after a whiplash injury the more likely serious complications develop. Some complications can be caused by damage from the injury and possibility become permanent. Often years after car accident victims settle their insurance claims, roughly half of them state that they still suffer with symptoms from their injuries. If you have been in a motor vehicle or any other kind of accident, don’t assume that you escaped injury if you are not currently in pain. Please let Dr. Gallentine at Greater Cincinnati Chiropractic do an assessment you to see if you sustain any underlying injuries! Our Cincinnati based auto accident Chiropractor, Dr. Garrett Gallentine will make sure that you are treated in a professional manner, as we assess your injuries, develop a course of treatment (only if necessary) and work with you to explain your benefits and help you navigate through the whole process. We Work with Auto Insurance Companies in Cincinnati and Northern Kentucky! Waiting can cause further damage!